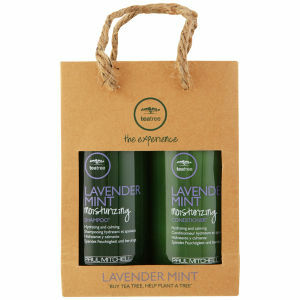 Treat your hair to the Lavender Mint Bonus Bag from Paul Mitchell. Combining a calming shampoo and comforting conditioner, hair will be left perfectly cleansed and deeply rejuvenated. A calming shampoo that works to cleanse, soothe and hydrate dry, unruly hair. Infused with amino acids to strengthen strands and enhance shine from root to tip, whilst a blend of lavender, mint and tea tree soothe and comfort the senses. Effortlessly detangle locks with the luxurious conditioner; a weightless formula dedicated to hydrating, softening and replenishing dry, thirsty hair. Ultra-rich conditioners deeply moisturise each strand to leave you with healthy-looking, calm and manageable locks with every use. Both products are gluten free and colour safe. Suitable for vegans.